A few years ago I took a trip by train for 11 days through Budapest, Vienna, and Prague. The trip began with sightseeing in Budapest for the weekend. I knew nothing about the city before arriving and it was a pleasant surprise (This is why I say “say yes” to spontaneous adventures!). I especially enjoyed the food. Everything I ate was fantastic. Budapest also has beautiful architecture dating from Roman ruins to Gothic, Baroque, Renaissance, and much more. Now that I am living quite close to Hungary I am interested to see what other areas I can explore. I’d love to hear recommendations (bonus points for castles and epic food). Travel tip: When planning your trip to Budapest, note that many places are closed on Mondays. Budapest is split into two parts; Buda and Pest, separated by the Danube River. For the first day, I ventured to the Hungarian Parliament Building on the way to Buda. This building is so impressive, and in my opinion, rivaled maybe only by Westminster. In Buda you can walk up the hill to the Citadella which has the Liberty statue and great views over the city. Buda Castle is occupied by museums, which I didn’t find interesting, so I just explored around the grounds. Afterward, I walked north towards Matthias Church and Fisherman’s Bastion. The Fisherman’s Bastion stands where castle walls once were but is a relatively newer structure built simply for panoramic views of Budapest. Matthias Church has really amazing tile work on the roof. For almost every meal in Budapest, I ate at the Christmas Market. It had a huge section devoted to traditional Hungarian foods. I love street food, markets, and saving money so this was great. I tried so many dishes and different hot alcoholic seasonal beverages such as Grog which was so delicious. I also want to note that this was my favorite Christmas Market that I have been to. It felt authentic and the stands were selling unique items, actually handcrafted by locals, whereas other markets I’ve been to have a lot of the same stuff as each other. From the markets, I wandered down Vaci Utca. Which is the main shopping street of Budapest, full of familiar and some not so familiar storefronts. The perfect place to find some souvenirs, browse some boutiques, and other shops. In the evenings, I could not pass up the opportunity to explore the ruin pubs. Ruin bars are notorious in Budapest as they were abandoned buildings taken over by the locals as low-key clubs, but now seem to be primarily occupied by tourist. If you find yourself on Kazinczy utca (utca means road or street in Hungarian) you can find Szimpla and Ellato Kert, two famous ruin pubs. They are both a must see in my opinion and a really fun experience. Don’t forget to try pálinka, a very high alcohol content fruit brandy, which can only be authentically produced in Hungary and some parts of Austria. On the same street, you can find Karavan, which is a tented area with street food stands. Off of Kazinczy there is a “hidden” passageway called Gozsdu Udvar which is full of bars and restaurants it is definitely a cool place to check out for some nightlife. The second full day was another packed day. I decided to explore more of the Pest side of Budapest. First stop was Hero’s Square (Hősök tere), built during the Austro-Hungarian Empire, is an important political monument in Hungary. Next stop was Vajdahunyad Castle, built in 1896, and currently houses a museum. I passed on the museum and instead purchased tickets to go up both available towers (Gatehouse Tower for €2 and the Apostles’ Tower for €4). The Gatehouse tower is a bit of a waste, you don’t see anything that you can’t already see better from the Apostles’ Tower. 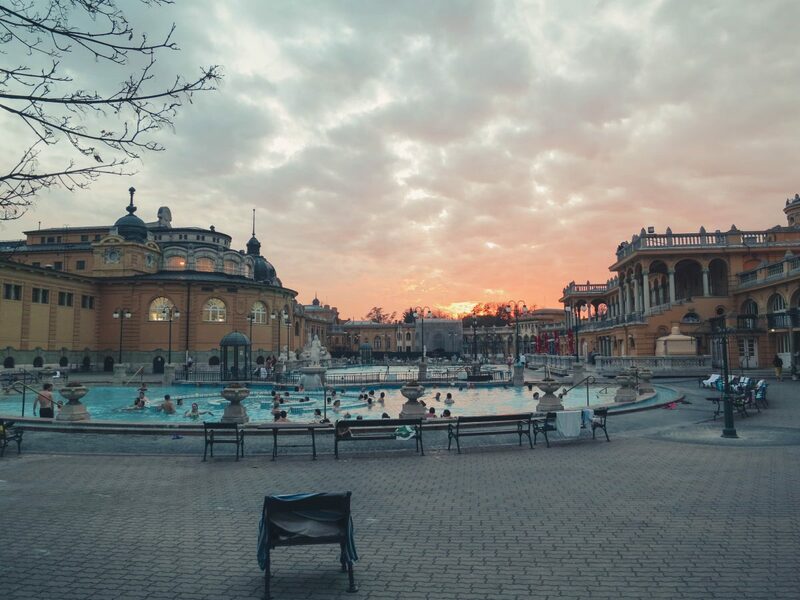 Szecheny Thermal Baths are one of the most famous of thermal baths in Budapest, but certainly not the only one. It is the largest medicinal bath in Europe. I am not sure what I expected, I wanted to try a new experience, but to be honest, it will need some getting used to. It feels like you are sitting in a bath with strangers. Also, when I travel, I am not often looking to relax, rather to take in as much as I can. The inside baths which close at 7 pm are much warmer than the outside ones. With your entrance fee, you are allowed to access both inside and outside baths as well as to a Turkish bath and sauna. There is the possibility to schedule massages and other treatments for an additional fee. As I mentioned earlier, I was really impressed with the food in Budapest. Below are some of the things I ate. The top left is goulash, a typical Hungarian soup, the top right is langos with garlic, sour cream, and cheese, another traditional dish and definitely perfect for a late night snack after the bar. On the bottom left is stuffed cabbage, a Hungarian dish made with pickled cabbage and stuffed with beef and ground pork and is topped with sour cream. And, the bottom right is gelato from Gelarto Rosa, every blogger wrote about this place, and I mean come on, it is the perfect Instagram-worthy treat, the bonus was that it also tasted amazing, do not pass this place up. The final day in Budapest before jumping on a train to Vienna I stopped by the Central Market. It is huge and the ground floor is full of produce and meat stands. The second floor is where you can find some small food stand and souvenirs. After I had some breakfast I took the train to my next destination. Vienna is the city that sparked my interest in Europe. All of the great classical musicians have lived and performed there. If you want to read about my experiences you can read them in this post. I feel like I wrote so much, but I am also afraid I left things out, which is possible! But these are my highlights from my trip, and I hope now you have an interest in visiting this beautiful city. Pin this post to one of your boards for safe keeping. This trip was part of a 3 country tour via train. If you want to read about my experiences in the other countries check out these articles. I was there in fall, not too cold, such a good time. Budapest filled my heart! Even though we experienced a ton of rain I couldn’t wipe the smile off my face! Oh I’d love to go here. Your photos are so good!! What a great trip! Wow, it looks like you had a great time in Budapest. It’s not a city I’ve ever really looked in to visiting before, but it looks like a beautiful place – will have to bear it in mind next time I fancy a break!